Can you believe it’s almost July already?! Seriously, it feels like just last week I was picking strawberries and celebrating Father’s Day. 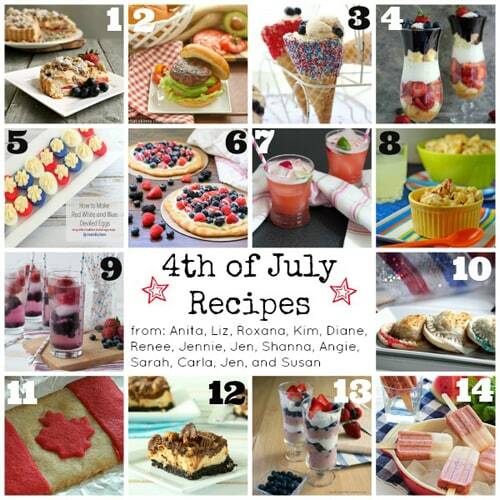 Now here we are getting ready to celebrate 4th of July (and July 1st for my Canadian friends). 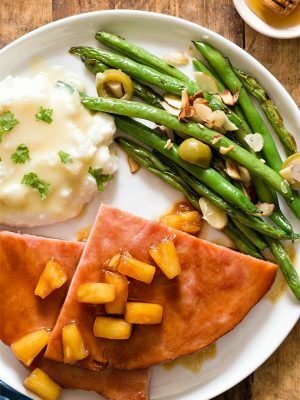 Holidays mean parties, and the Holiday Food Bloggers are back to bring you sweet eats. 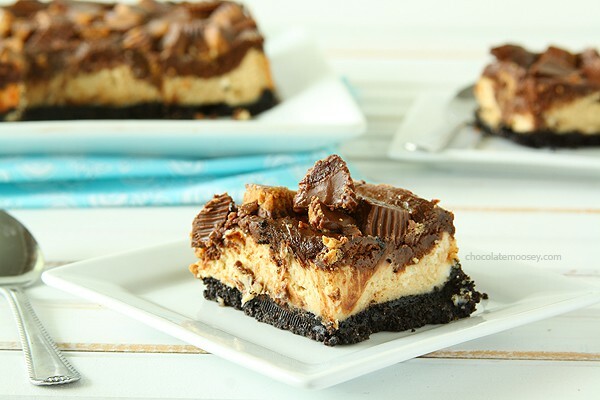 I’m bringing Chocolate Peanut Butter Cup Cheesecake Squares because what’s a party without cheesecake? I thought about doing something red, white, and blue, but my inspiration just wasn’t there. Instead, I went with my craving and made squares of layered chocolate and peanut butter cheesecake with an Oreo crust. 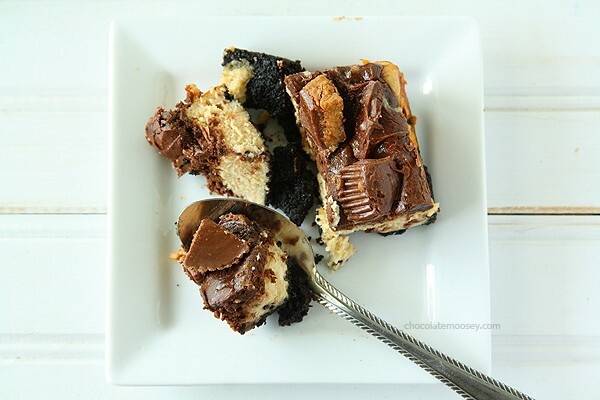 I first got the idea when I saw cheesecake squares that were layered with Nutella. Nutella and peanut butter have the same consistency, so I knew I could swap them. 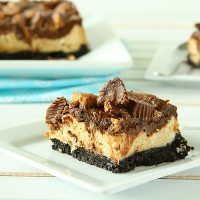 Then I took it one step further and sprinkled Reese’s peanut butter cups on top (wait, do they even make other brands of peanut butter cups?). Usually if I bring food to a party, I try to make sure it is something that can be easily served. It’s a lot harder trying to fit a slice of cheesecake onto your already-overflowing plate than to simply place a square on top. Now if you pile on the whole pan, then that might be a different story. You don’t need a celebration to make these cheesecake squares though, despite my coworker’s reaction. He doesn’t understand why I make dessert “for the hell of it.” Let me get this straight – you are questioning free food? 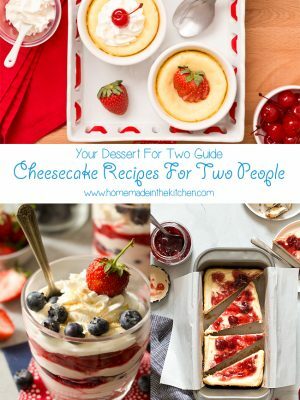 Do you know how many people would fight for free cheesecake? I bake because it releases the chaos going on inside my head. 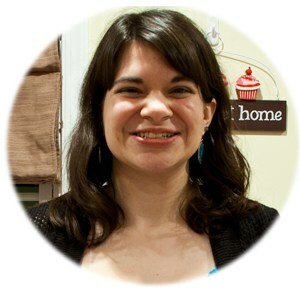 I tend to be misunderstood at work, and baking (and blogging) gives me a sense of belonging. You may now lick the screen. Preheat oven to 325F degrees. Line an 8x8 pan with parchment paper (or lightly grease the pan). In a medium bowl, mix together the Oreo crumbs and butter. Press evenly into the bottom of the pan. Bake 10-12 minutes or until set. Let cool completely. 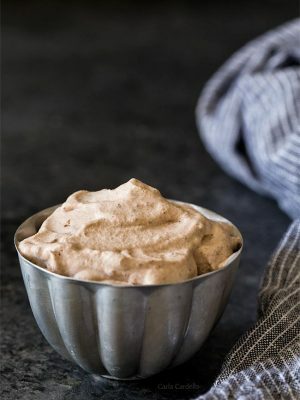 In a large mixing bowl, beat together the cream cheese and sugar until creamy, 2-3 minutes. Beat in the eggs, one at a time, until smooth. Beat in the heavy cream and vanilla. 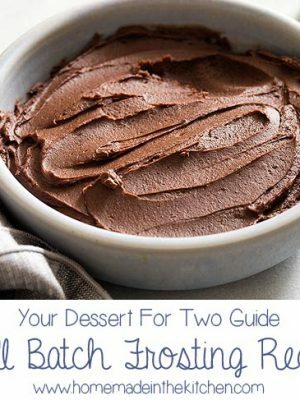 Remove half of the batter and place in a bowl. Beat in the melted chocolate until blended. Set aside. 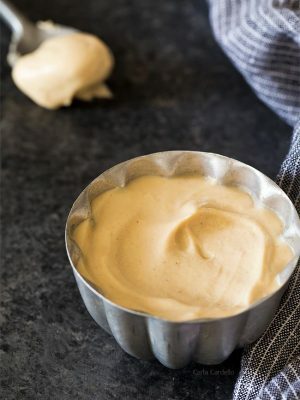 With the remaining batter, beat in the peanut butter until smooth. 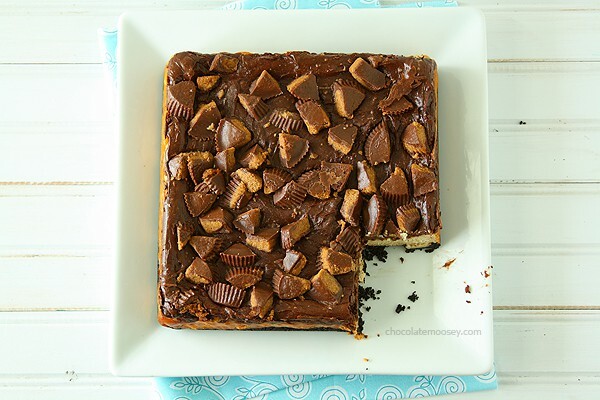 Spread the peanut butter batter over the cooled crust then spread the chocolate batter on top. 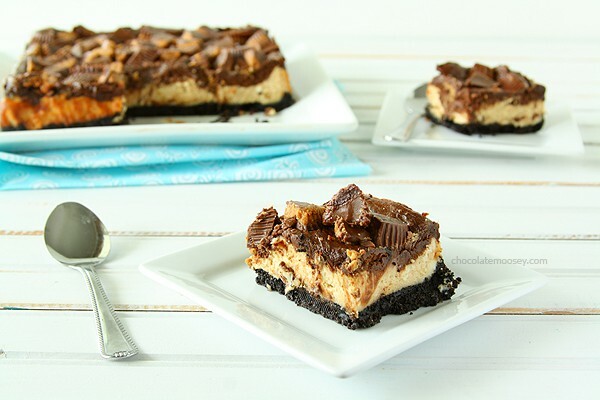 Top with the chopped peanut butter cups. Bake 35-40 minutes or until the center slightly jiggles. 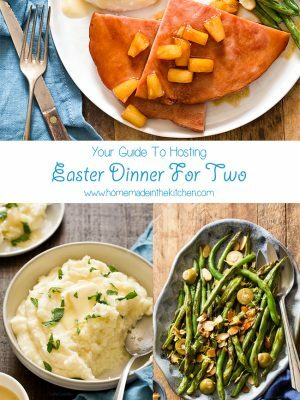 Cool completely to room temperature then chill in the refrigerator for at least 3 hours or overnight. Oh, man, these look incredible! So scrumptious and totally irresistible!! It’s not a party until the cheesecake arrives. This looks amazing, Carla. I’m labeling you the Cheesecake Queen. Because, you are the queen of cheesecake. Girl, you are the cheesecake queen. Can I move in? 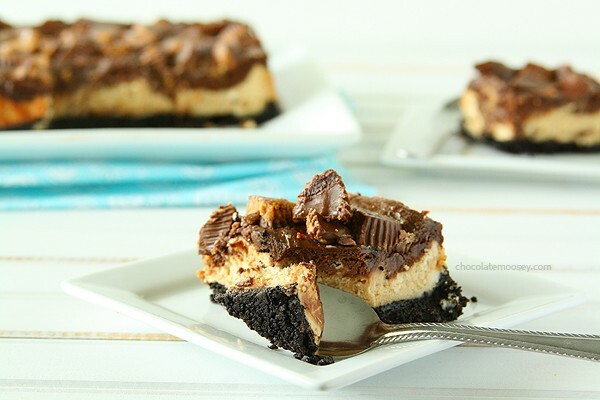 Oreos and Reese’s Peanut Butter Cups plus cheesecake. I’m in dessert paradise with this one Carla. If your co-worker was at any one of the agencies I’ve worked for, he wouldn’t have a chance to ask such silly questions because he would have already been trampled to death by hundreds of workers stampeding to the kitchen to grab the free baked treats. And for this one, I’d be the first in line! I’m so glad you went with your instincts and made what you wanted to eat. I may or may not have licked my screen for about fifteen minutes before composing myself to write this comment. Girl, there are some fools in that office of yours – I have never in my life EVER questioned free delicious food. If only we lived near each other – we could join forces and create our own dream job. We’d blog and bake and sell what we bake and eat all our profits and then realize that we’re still poor and then do something about it and slowly take over the world. Wow now those look like bars I could just sink my teeth into! 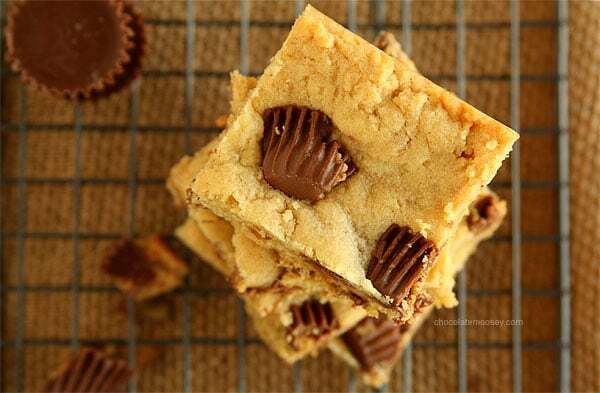 Love Reese’s! 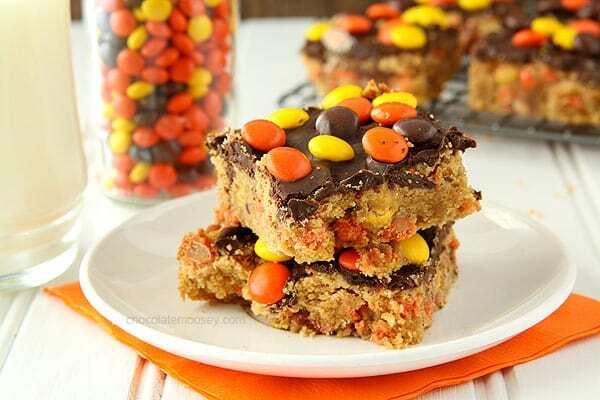 Oh my, these look absolutely sinful – and delicious! Can’t wait to try this spin on them. I’ll take a whole pan to go! I know my hubby will love this! Aaaah! You’re killing me! I would LOVE a pan of these! 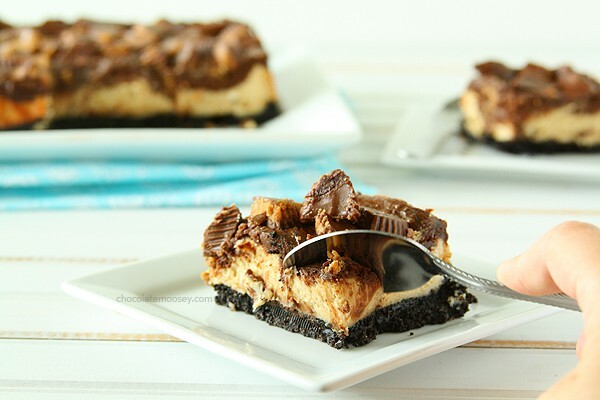 I licked the screen and it tasted of disappointment, not these amazing looking chocolate peanut butter cup cheesecake squares. I just drooled typing that sentence. I shall commission my younger brother to bake a tray of these when I’m back in England, as I’m travelling now, and my baking is atrocious. I did lick the screen, actually. 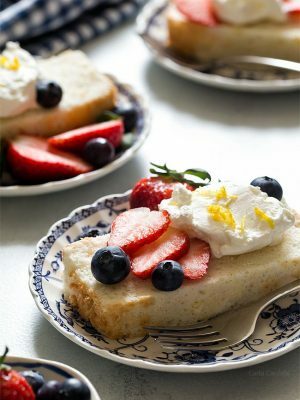 And I’m glad blogging gives you a sense of belonging… because you AND this fabulous dessert both belong wherever I am. Immediately. Heck yes! I’d be all over that. 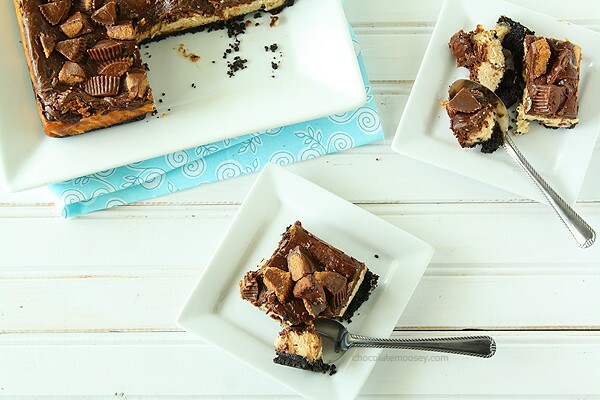 For your Chocolate Peanut Butter Cup Cheesecake Squares (which look YUMMY!!!) could you please tell me the quantity of heavy cream needed? THANKS!! Looks like I forgot a word! It should say 1/4 cup. Thanks for catching. I made these last night!! DELICIOUS! I just put them in cupcake liners ans a cupcake pan, 325 for 22mins and they were so pretty and I loved the peanut butter! 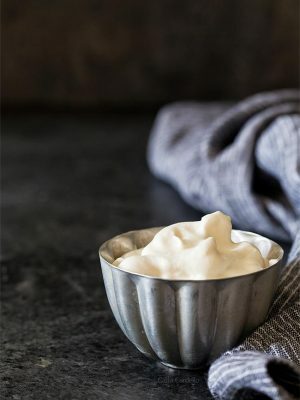 So creamy! Mmm love how you made them into cupcakes! Easier to share. Glad you enjoyed them. I’d say up to 1 week in an air tight container. Step 3 says: beat together the cream and sugar until creamy. Is that the cream cheese, or the heavy cream? Later it says, Beat in the cream and vanilla. Of course that’s whichever is left, but I’m concerned if one should definitely go before the other? 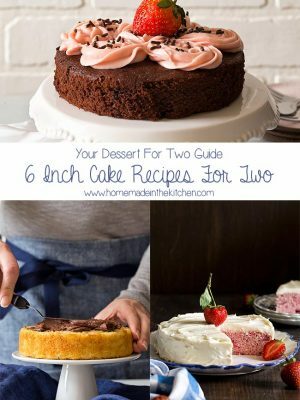 I don’t bake much, and this is for my honey, I want to do it right. Thank you!! Good catch! I must’ve had a brain fart while typing it. It should be “beat together cream cheese and sugar until creamy” then later on add the heavy cream with the vanilla. I’ll fix it. Thanks! This looks absolutely scrumptious! I just want to know how did you get the cheesecake out of the tin after baking? I’ve never seen a square springform tin and I am worried about damaging the deliciousness when it’s ready to serve. It’s a regular square pan, not a springform pan (I haven’t seen a square springform pan either!). I lined the pan with parchment paper with enough paper hanging over the edges to act like a handle. Then I pull the bars out of the pan as one whole square. It’s more like you’re making cheesecake bars than a traditional cheesecake.